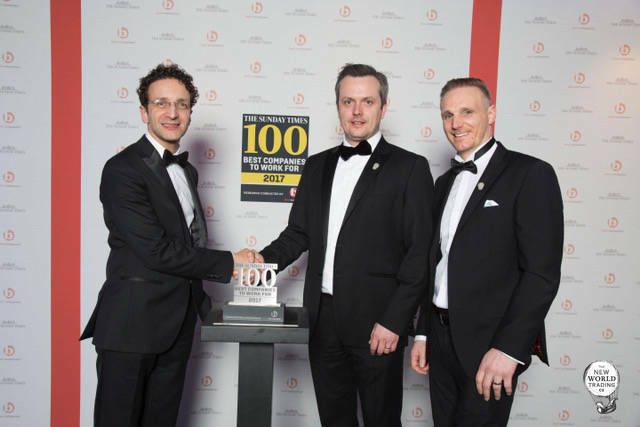 New World Trading Company (‘NWTC’), has been awarded a place in ‘The Sunday Times 100 Best Companies’ 2017, as the 10th best organisation to work for in the UK. The incredible achievement relies upon the NWTC employees’ responses to the Sunday Times survey for their level of happiness and job satisfaction. Chris Hill, Chief Executive of NWTC, believes the top ten ranking is down to the strong leadership across the business married with an innovate and fun development program for every member of staff. Chris Hill comments: “I am extremely proud of how much NWTC has grown over the last 12 months, not just with the increased number of sites but also from an operations perspective. We still pride ourselves on having talented management but also that each employee knows they are a crucial part of the company’s success. NWTC, which currently operates 15 pubs across the country, is also delighted to announce the opening of a new site in Reading this May. Along with the new venue in the South of England, NWTC will also be opening in Didsbury and Birmingham by the Summer 2017. The new sites will bring an additional 200 jobs across the group increasing the overall team to 1200. As the employee numbers continue to grow so does the focus on staff development. The company’s engagement scheme ‘Tribes’, brings together employees from every site into one of six ‘Tribe’ teams, with the aim to develop their communication skills and team spirit. The revolutionary scheme has already received high praise across the industry and is a contributing factor for the high positioning in ‘The Sunday Times 100 Best Companies’ award.